The item is a set of 5pcs professional and practical flat blade slotted screw drivers in different sizes, which are mainly made of durable hard steel material, and perfect for repairing watch, changing batteries and screwing the clamp eyeglass frames, etc. Besides, each screwdriver is equipped with a spare blade for replacement. With comfortable-to-grip handle and easy to use, it is really a wonderful precision screwdrivers kit for choice. - Material: durable hard steel and aluminum alloy. - 5 different sizes: 0.8mm, 1.0mm, 1.2mm, 1.4mm, 1.6mm. 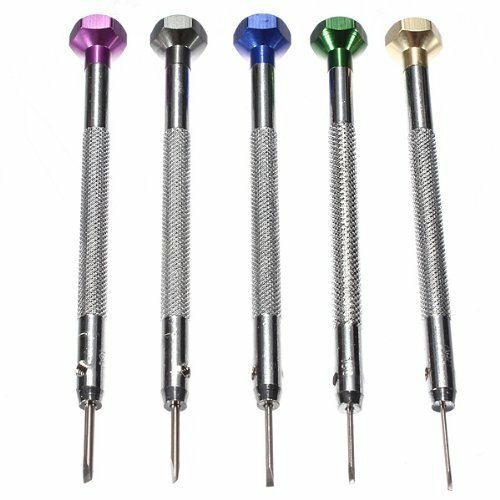 - 100% brand new and high quality Precision Flat Blade Slotted Screw Driver Screwdrivers Watchmaker Repair Tools. - Standard flat blade screwdriver with swivel head, simple and practical. - Perfect for repairing watch, changing batteries and screwing the clamp eyeglass frames, etc. - Each screwdriver comes with a spare blade for replacement. - Packed in a plastic storage bag, for convenient to store and carry. Material: durable hard steel and aluminum alloy. 5 different sizes: 0.8mm, 1.0mm, 1.2mm, 1.4mm, 1.6mm. Standard flat blade screwdriver with swivel head, simple and practical. Perfect for repairing watch, changing batteries and screwing the clamp eyeglass frames, etc. Each screwdriver comes with a spare blade for replacement. If you have any questions about this product by Foxnovo, contact us by completing and submitting the form below. If you are looking for a specif part number, please include it with your message.